They’re hard to miss — you just have to look. Thursday is the first day of the annual Agricultural Fair of the Martha’s Vineyard Agricultural Society, running through Sunday. Everybody, see you there! 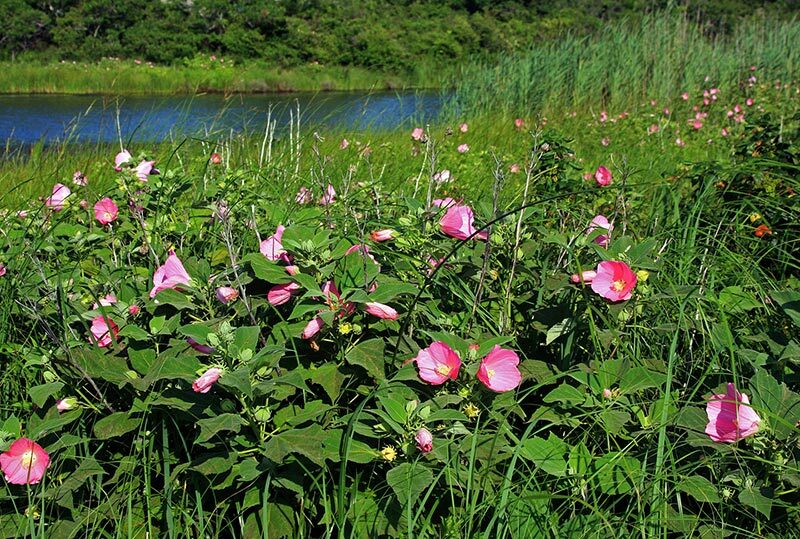 The Island’s brackish wetlands and pond shore areas are breathtaking now with panoramas of marsh mallows. Mention of the spectacular sight elicits a surprisingly blank look from many Islanders, considering how iconic it is in our August landscape. Who knows what this lack of knowledge signifies, apart from how cut off from landscape many of us are, and how cut off from the shores of our beautiful Island we have become. In the early fifties, we were poor here, relative to the wash-ashore affluence and material well-being many Island residents enjoy today. It seems, however, that we were able to enjoy summer; parents were working hard but not at multiple jobs. Activities were less structured; children picked blueberries and roamed quite freely. Youngsters could be parked, “going to the beach,” with a towel and sandwiches as an everyday summer pastime. I am guessing that many more Islanders in that era had actually seen the marsh mallows in bloom. Today, there are many perennial hibiscus hybrids, blended together from the species’ genetic material, that produce the stupendous architectural plants and flowers known as “dinner-plate” hibiscus. These are all garden friendly, wanting only to be located in a warm, sunny garden spot with adequately good soil and water delivered to the roots. The August garden owes a great deal generally to the entire Hibiscus genus; along with the foregoing, the rose-of-Sharon (Hibiscus syriacus) is an absolute mainstay, and containers would be the drearier without dependable tropical hibiscus, with summer-long, guaranteed bloom. However it is Hibiscus moscheutos subsp. palustris (Malvaceae), the native of the pond edge, that I would like to explore briefly, for it would seem to be useful in a number of Island garden situations, especially now that many are irrigated. In the August 2016 print issue of The Garden (Royal Horticultural Society), Roy Lancaster recounts a 2007 Island visit with Stephen Spongberg, where they “botanized” verdant mallow colonies and associated flora. Mr. Lancaster gives cultural advice from a UK perspective. Late-emerging perennial hybrid hibiscuses form large crowns and root systems; it is reasonable to expect the native species to do likewise. Dwelley describes the plant as five to seven feet tall, with numerous cane-like stems. Unlike the “dinner-plate” hybrids, the species flower resembles more an outsized hollyhock. The color ranges from whitish with maroon eye to baby pink to full-on, glowing, bubblegum pink. Felty, toothed foliage, lance to arrowhead-shaped, is a soft mid-green. Marsh mallow and hibiscus in general are prey to damage from Japanese beetles and the hibiscus sawfly. These insects are hard to control, organically or even going nuclear, so good culture is usually the best defense. Conversely to growing marsh mallow in the moist domestic landscape, the dry garden is a whole different challenge and concept. Based on the proposition that water and other inputs are or may become scarce, this garden (also known as dry-land gardening) is intended to grow and flourish due to informed plant selection and cultural practices that make the most of what one has. The dry-land garden is not only a sunny environment but is also found in dry shade; many tiny shady urban back gardens will be dry due to urban heat Island effects, tree roots, and poor soil. Therefore, the gardener must study plants and be willing to set aside preconceptions of what a garden is, in favor of what can be grown. Island gardeners may avail themselves of the Polly Hill Arboretum Plant Selection Guide, plantfinder.pollyhillarboretum.org/. For those who are interested in this topic, the new German Garden, as practiced at the Hermannshof Gardens sichtungsgarten-hermannshof.de/ and at Weihenstephan,hswt.de/en/weihenstephan-gardens.html emphasizes the low impact, low input naturalistic concepts of plant communities chosen for their ability to work together and to segue throughout the growing season from one stage of development into another: bud — blossom — seed head — senescence — and breakdown. This is something quite different from our tight little groupings of this and that, sheared, weeded, fertilized, and colorful — always colorful. Consider using thick pea stone mulch, or one made from the by-products of local Island tree work, to keep moisture deep in the soil. Consider that half the plant is underground. Consider using plants known to have low water requirements. Consider that “bigger” or “taller” is not always “better.” Consider letting annuals and perennials self-sow where they feel happiest growing. Instead of exercising control, see what happens! Some very wonderful gardens can be the result. Yellowing or drooping foliage on shallow rooted rhododendrons and water-hungry hydrangeas shows the recent heat wave’s stress effects. Add mulch and step up watering. Keep an eye on window boxes and containers. Did your combos work out, or were they a disappointment? Trim up, prune, take cuttings, or figure out replacements better suited to the situation. Add slow-release prills, or water with soluble plant food or homemade teas. Deer are aggressively browsing fruit trees. Wide surrounds made of wire or netting stiffened with rebar, buckled down with earth staples, may fend them off. Hill (or mound soil around) leeks. Water the vegetable garden and continue to use Bt on brassicas against caterpillar damage. Bt works against lepidopteran caterpillars but not against beetles and earwigs, and must be reapplied to new growth.